Private tuition can be organised at a time and date to suit you. We can design a workshop or class that is bespoke to you and will cover exactly what you wish to learn. You can have the option to bring your own flowers and materials or we can provide these for you. All of our commercial courses can be delivered privately. Students can also decide on the specific techniques they wish to learn. 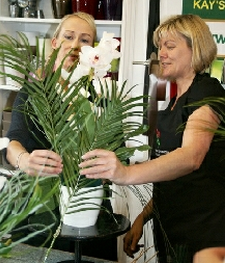 Flower shops wishing to send staff for specific training can design the course to their own requirements. Groups and organisations can book any of our tutors to deliver training either at our school or onsite at your own venue. This training can be designed specifically to your requirements and budget. For more information or quotation on our private or bespoke course you will need to speak to us directly by email or phone. Kays School of Floristry is recognised within the florist trade as the leading commercial flower arranging and floristry school where most florists begin their career.